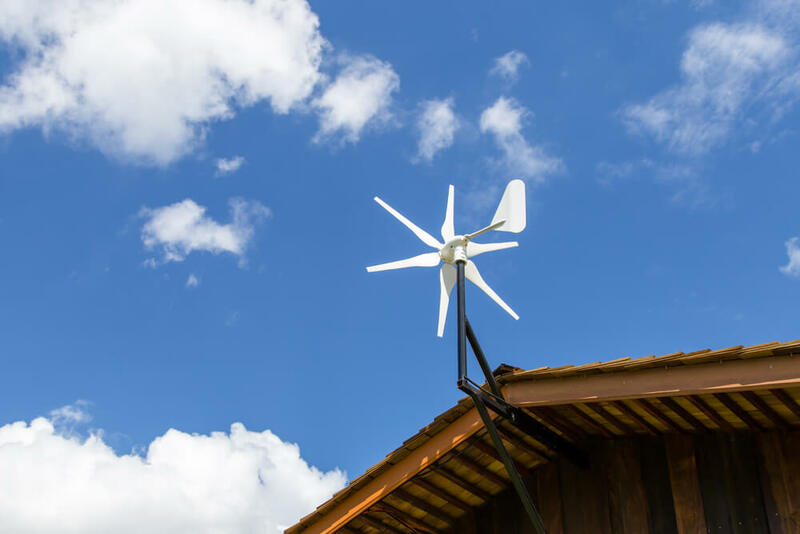 If you want to increase the energy efficiency of your home while staying environmentally conscious, a wind turbine for home is an exceptional option to consider. 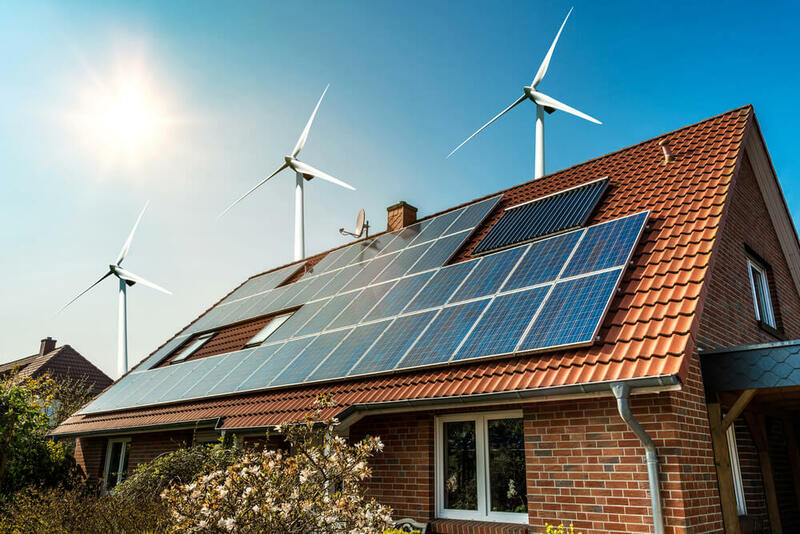 If you want a power source to help generate electricity that doesn’t leave you completely at the mercy of climate change, it’s important to consider your best home wind turbine options to ensure you select one that meets your needs. Today, we’ll go over our top picks for the best wind turbine for home that you’ll definitely want to take a second look at. Next, we’ll walk you through our efficient buyer’s guide to help ensure you make the right choice with your wind turbine purchase. The first wind turbine for home on our list is this powerful Wind Turbine Generator Kit by Windmill, featuring 1500W rated power and a rated speed of 46 feet per second. At first glance, the Windmill Kit looks just like a regular turbine. However, if you take a closer look, as we did, you’ll see that it’s actually so much more. The model is by far one of the strongest turbines currently on the market, with an insignificant weight of just 33 pounds. What’s more, the unit features an automatic braking system integrated directly into the wind turbine, which prevents damage or movement if a mighty wind starts to blow. Another feature we really liked about this product by Windmill is the fact that it is super easy to install on your own. You can use it in congruence with a solar panel for extra power, which is an additional plus. Besides these fantastic features, the Windmill Wind Turbine Generator Kit has a weather resistant cover that helps it ward off damaging elements such as UV rays and others. We also really liked that this wind turbine uses a combination of manual and automatic braking, giving the owner optimal user control. That means that if you’re dealing with a period of excess wind levels you can stop the system, so it doesn’t wear out too fast. The next wind turbine on our list features a mighty 700W rated power, along with a max wattage of 720W for a boost of extra energy. With an electromagnetic braking system and nylon fiber blades, this choice could be a strong contender for your shortlist. The Happybuy Turbine Generator is an unquestionable powerhouse of naturally sourced energy. With an astounding 700W of rated wattage and 24V DC rated voltage, this durable unit stands the test of time and resists strong weather elements like a champion. We really liked the 3Phase AC PMG, or permanent magnet generator, with its powerful microprocessor. The 3Phase AC PMG helps the turbine accurately and safely regulate voltage, make the most of high wind energy, and up its total power processing time. The blade material is another huge plus for this product. Manufactured with strong plastic and 30% carbon fibers, the corrosion and element resistant blades are an ideal choice for rough weather areas. What’s more, the blades operate smoothly and quietly, so the rotor won’t generate distracting noise. The fixed dual bearings of this wind turbine serve as a great stabilizer, giving it a low beginning wind speed. As such, it has the ability to transmit more electricity at reduced wind speeds, increasing its overall productivity and longevity of use. While we wish the braking system included some manual components, the electromagnetic design is very dependable. The product provides 2,000 watts of pure power with its 28 rare earth magnet rotor and 11 blades. It even has a cut-in wind rate of 6 mph for massive output. With a wind speed rating of 15 mph and an astounding 2,000 watts of energy output, the Missouri General Freedom II is a force to be reckoned with. In fact, it can handle wind rates of as much as 125 mph! Without a doubt, the aesthetic qualities of this wind turbine are among the best in its class, with attractively designed blades to fit with an array of user preferences. You can purchase this product in either black or white as you prefer. Plus, the Freedom PMG rotor has double the amount of copper as other types of products on the market, which translates to a quicker battery bank charge time than most. We really love Missouri General Freedom’s 3-year limited warranty, which makes this product an excellent choice for both residential and commercial use. The 11 carbon fiber blades of this wind turbine are fully galvanized, which means they are highly durable to stand up against harmful weather elements without incurring damage or rust. So, this product is a great choice if you live in a region with lots of humidity or frequent storms. We would say that the 6-mph cut-in wind speed is average, but the turbine still offers a consistent 15mph rate. The Popsport Wind Generator wind turbine has a mid-range rated power of 400 watts, plus a nice start-up wind speed of 2.4 m/s, making it a good choice for anyone who doesn’t live in storm-heavy regions. If you’re looking to boost your off-grid power supply, look no further than the Popsport Wind Generator wind turbine. With 400 watts of rated power, you’ll enjoy a quiet rotor home that won’t cause any distraction with unwanted noise. It transmits far less vibration than most turbines on the market today, but you’ll still enjoy an ongoing 2.5m per second wind speed. We like that the stator and permanent magnet generator work together to lower torque resistance and ensure the sturdiness of the turbine. If you live in an area with moderate wind rates and not too many storms, this product is an excellent contender for you to look at. However, if you live in a region that gets a lot of storms and high wind speeds, you might need a sturdier product. The good news is, the streamlined design of the Popsport wind turbine makes it an excellent fit for any setting, including rural and urban regions. What’s more, the turbine’s generator charges batteries for fixtures like an RV or boat, so it has a fantastic array of uses. We also like the fact that the turbine only weighs 17.3 pounds, so it is easy to move if necessary. The final product on our list is this 600-watt unit by Eco-Worthy. The kit includes a 400-watt rated power turbine and 100-watt solar panel for a comprehensive device to meet all your needs. The final product on our list is actually a comprehensive kit, making it an ideal choice for regions with mid-range wind speeds and moderate storms. The kit includes a hybrid controller along with the turbine for ease of use. We like the fact that the controller sports 12v/24v autodetect capabilities, so you can connect the battery to the controller, then link the turbine and solar panel to the controller. In order to use the full kit, you will need to purchase additional electric cables to link the solar panel and turbine to the controller. These are not included. The kit also does not include a pole to position the solar panels and turbine, so you will need to purchase this separately. The Eco-Worthy Wind Solar Power Kit is a great option to charge your off-grid 24V system. Even when you are experiencing lower levels of light, you’ll still get plenty of performance out of this kit. Due to its industrial grade manufacturing, this turbine kit is one that can last for years to decades without downgrading its total performance or energy output. The DC12-24V nominal voltage and service voltage is also phenomenal. Wind turbines are a fantastic power source that converts wind straight to electricity. When the wind blows, the force of the wind spins the rotor of the turbine and puts the blades into motion. Once the blades start moving, this powers the generator in the wind turbine, generating a constant cycle of clean, green energy. These days, wind power isn’t just for commercial or large-scale use. You can also use a wind turbine in residential areas to generate environmentally friendly energy that could keep an entire house powered. But first, here are some key elements you need to consider before purchasing one for your home. Before you purchase the best wind turbine, you need to consider what the rate of wind is in the area you live in. If your region only experiences very low wind levels, it probably won’t be worth the time and effort to install a wind turbine. If you have at least 11 miles per hour of ongoing wind in your area though, a wind turbine could be an excellent option to keep your home powered up. You also need to determine if you have space for a wind turbine, and if so, where you plan on putting it. Houses situated on land out in the countryside or on farms are better suited to wind turbines than the bustling suburbs. For example, if you live in the city with lots of buildings, you’re going to face some space hurdles to install your wind turbine. That’s not to say it is impossible, but you need to make sure you have enough space to work with. The good news is, you can install a wind turbine in a variety of areas, from front lawns to boats to rooftops. Just bear in mind any surrounding neighbors or wildlife that could interfere with the wind turbine, and ensure you install it in a safe spot protected from the elements. A final pre-purchase consideration is whether you intend to go off-grid or stay connected to a grid. Off-grid simply means that you won’t be connected to a local energy grid and intend to depend on your wind energy alone as a source of power. It is usually advisable to install a combination or hybrid system with both wind and solar capabilities, so you have sufficient energy in off-grid scenarios.
. So, you’ll be contributing sustainable energy not only to your own household but back to the environment as well. How Do Wind Turbine Kits Work? You already know the basic functionality of how the wind turbine itself works, generating electricity from wind. The wind propels the turbine’s rotor and moves the blades to promote energy flow. A wind turbine kit is simply a comprehensive package including not only the turbine but add-ons like a controller and solar panel for an optimal hybrid function. With a wind turbine kit, you’ll typically need to mount it onto a pole, then link the system to the energy grid. When a turbine kit includes solar panels, you’ll have additional off-grid power that never runs out. The charge controller is another important feature of a wind turbine kit because it helps you prevent battery overcharge. In simple terms, this means you’ll enjoy a longer battery life and a more stable wind turbine operation. How Do I Know a Wind Turbine Will Work in My Home? There are a few main elements you ought to consider to determine whether a wind turbine will work in your home. Of course, you should live in an area that experiences a moderate level of wind. But this is not necessarily the primary aspect you should consider to identify whether or not a wind turbine will work with your current space. You should live on at least an acre to make the purchase of a wind turbine a worthwhile investment, according to the U.S. Department of Energy’s Small Wind Electric Sytems Guide. Rural areas are definitely more compatible with wind turbines. For example, if you live in a residential suburb, you might run into some problems with your homeowner’s association and/or zoning requirements, so you’ll need to check those out before moving forward. Once you know what your local requirements are, you should take a look at the average wind rate in your area to ensure you’ll be generating enough power to make the purchase a worthy one. If you have a sufficient wind rate, enough space, and no zoning issues, you can pick the wind turbine to meet your preference. The great thing about wind energy itself is that it’s 100% free. Operational costs are almost nothing and wind energy is a great way to reduce overall dependence on energy sources like gas, oil, and coal. A wind turbine is a clean and renewable power source. It is cost effective and has the capability to keep multiple homes powered at once. Wind turbines are also easy to install on farms and rural areas where farmers can generate income from providing electricity to local residents such as wind plant owners. There are a few cons you should factor in as well. Remember, the wind is not a constant factor in most locations, so it is not always something you can rely on 100%. In fact, most turbines operate at about 30%. So, if you rely on wind power alone, you might find yourself without sufficient power some days. Wind turbines can also be hazardous for natural wildlife, particularly if you reside in a more rural area. Depending on the type of turbine you purchase, the unit will generate between 50 and 60 dBAs of sound, which could get noisy after a while. If you live in a residential suburban area, your neighbors might not prefer the appearance of a turbine. Another important reason to check your homeowner’s association and zoning rules. Depending on the unit you pick, wind turbines can be costly to install and set up. However, if you select a sturdy turbine or turbine kit, it can last you for many years to come. In general, wind turbines with under 100 kilowatts of power cost between $3,000 to $8,000 per wattage capacity to install. Wind turbines are a renewable, innovative source of clean energy that could keep anything from your RV to your entire home powered up. If you’re looking to start small and don’t need a wind turbine for the home for excessive wind levels, go with an option like the Popsport Wind Generator or Eco-Worthy Wind Solar Power Kit. Otherwise, any of the higher-wattage units mentioned like the Turbine Generator Kit by Windmill are a fantastic way to get started with wind energy. Remember to review your local wind rate and any neighborhood zoning or association requirements before making your final decision. That way, you can pick the wind turbine that is not only best for your energy needs but will integrate into the area you live in.